This five gallon cooling system developed by DesertSun02 on YouTube blows air over a frozen 1 gallon milk jug to create 5 hours of surprisingly cold air. Unlike the swamp cooler we published last summer, this invention will work great even in a humid climate – and it’s a much simpler design. Small fan with a removable base or one that won’t get in the way like this one. note: drilling these holes near to the base of the bucket cools better than holes in the top. Cut a larger hole in the lid, measured to fit your small fan. Attach PVC segments to holes. If your liner holes are too big, you’ll have to glue them in. Rest fan in the hole you cut in the lid and turn it on. Have you considered using peltier modules in this design? hmmm interesting idea. for heat reduction or for voltage generation? (both) but primarily what? Any other users do this? I tried it and it doesnt blow 45 degree air. Yea, we made 3 of them and it was more of a waste of space than anything. I feel like if the Styrofoam was cold and the pipes coming out were cold, then the air would have a better chance . There is no way to get good air circulating around the frozen jugs so its just stale semi warm air coming out. I took and made frozen bags of ice and suspended them with hangers inside the bucket so the air could go down between them and around them, and it only added a few lower degrees total. We tried this and it was worthless. The air was barely cool and didn’t help to cool the room. Which was 10×14. The best I got out of this is 71 degrees for about 15 min. I am going to try to cut the bottom out of the 5 gallon bucket and use frozen water in glass bottles, lay the bucket on its side and put the fan at one end so the air from the fan runs over the bottles and out the bottom of the bucket, lets see what happens. I fail to see how this will help in anything but the extreme short term. As the ice melts, this raises the humidity in the room – making it seem hotter and hotter as the humidity rises and your natural cooler (sweat) loses the ability to evaporate and cool your body. So, when you use the first one, it will seem hotter afterwards – making you refill it and use it again and again – all the while turning your room slowly into a sweatbox. Condensation would form on the outside of the jug, but I believe that condensation came from the air in the room in the first place. I agree with you Bruce.Loose ice would put humidity in the room but not ice in a sealed container. Ice cream containers hold frozen items not water that the ice will become after awhile. So how did it work out for you? Well done. One cannot argue with thermodynamics. You’re kidding right? There are whole political parties arguing about thermodynamics. IF the bottle of water is frozen in the freezer then the freezer must extract the heat and that requires a compressor and coils. The coils will (typically) exchange the heat into the room. The room (kitchen) is probably connected with the room being cooled so….. you are spending energy to move temporarily cool air around the inside of the structure! That the reason AC units exchange air outside. Bottom line- you’re fooling yourself. that is correct, the water formed is from the room air. If this is done intermittently in an open system, i.e., the heat from the refrigerator is allowed to travel out of the room on a cool day while it is doing the work of freezing the bottles, then the energy used to freeze those bottles becomes bound energy available to cool the room with windows closed on a hot day. Once you start re-freezing the bottles in the same room or connected room you are dumping the heat you just absorbed back into the same system. No net effect. If the freezer is located outside of the conditioned area, there will be a net effect in the conditioned area. Cost of freezing the bottles of water and running the fan represent the cost of cooling. @gazer you could be using a refrigerator that is in your garage. Then you can open up your garage to let hot air out. And if you didn’t open your garage door, your inside door that leads to the garage would be nice and heavy and it would keep the heat inside the garage. I thinking that the net effect on the inside of the house, or even a room, is off point. The device could never be considered to for AC of a room, much less a house. It’s spot air cooling. A fan that blows cooler, and relatively drier air. You are speaking of a device (freezer) that is in your home and running irregardless of the fact there may or may not be a jug of ice freezing inside of it. Also the entire point of this device is to exchange temperature/energy. Additionally some people have hot points in their home/office, for which this may function just fine. Say a small room with a server and a couple of clients in it. Which it why I’m interested. You cannot go off the 45 degrees in the video. Your ambient temp might also be higher or your fan speed is higher. Slower fan speed equals colder air.also with a milk jug I doubt humidity would be a factor. Hate to break it to you but that pipe in the video is 2″. 1-1/2 inside diameter therefore the 2-1/4 and 1/8 hole saw bit. Thanks – I sort of suspected this but I think he says 1-1/2″ in the video. For now I’ve changed it to 2″ in the article. Hate to break it to you, but that’s not PVC “pipe” in the picture or video. Those are couplers for 1 1/2″ PVC pipe– you can see the mid-stop ring in the center (inside of the coupler) in the picture. These have a 2 1/4″ OD (actually a tiny bit less). That’s why the 2 1/8″ hole saw for the styrofoam inner– makes for a squeeze fitting. I bought 1-1/2 inch couplers and they are to big to even go through the hole in the plastic, I also tried 1-1/4 which are a little to small so I will have to use some type of sealer. Reality Time! 2″ pipe is actually 2-3/8″ in diameter, so neither the 2-1/4″ or 2-1/8″ hole saw is applicable for 2″ pipe. What he may be using are couplings for 1-1/2″ pipe. (Note: 1-1/2″ pipe is 1.9″ in diameter.). Regardless, make sure your hole saw matches the OD of whatever size pipe (or coupling) you use. I totally thought the shiny air streamers to show air movement were water pouring out onto the carpet, had to click on this just to see what the heck was going on. As for the concept, you could have three water jugs frozen and switch them out as they melt. Would work well to take to a park-based family reunion in August where you would have electricity, for Grandma to sit by — I’m the Grandma who would like this. I thought the very same thing. After watching the video, am intrigued by the process. One could also use a 12VDC fan and a deep-cycle battery. For camping or in areas where no VAC is available. I agree with you. We play darts in are garage in the evening during the summer and have ceiling fans that help on the average day, but thought it would be worth a try on the really hot days in July and August when we have 95 to 100 degree weather and the night don’t cool all the way down. you can get the liners at Dakota Angler 5 gallon pail liner, 7.99. The insulated liners are made by Leaktite, the same company the makes Home Depot’s 5 gallon buckets, but not all Home Depots carry them. They are also sold at Sherwin-Williams paint stores and Ace Hardware. I found them for less than $3.00 at Sherwin-Williams. You can order the styrofoam 5 gallon bucket liners, a package quantity of 3 on line from Home Depot for about 18 bucks plus tax. They have a 6 pack on amazon for $10 that is prime eligable from plastilite I just ordered them and they will be here tomorrow, I paid the extra $4 to get them tomorrow instead of Friday. It’s just too damn hot to wait! I hope you get it working! Lots of great ideas in these comments for how to make the design better so that it blows cool air more effectively. 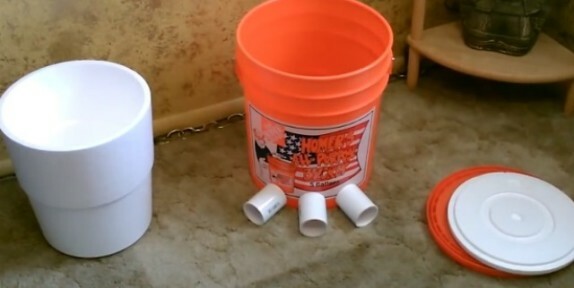 You can go online to Home Depot, (homedepot.com)they actually have the whole set up the homer bucket and a set of three of the 5 gallon Styrofoam inserts. Sorry they only come in sets of three. Just enter Styrofoam in search and they should come up. You may be glad they come in three as Styrofoam coolers not being that strong do break. Don’t bother looking for the liners. In the first place, the object is to transfer the cold of the ice into the room, whether by air flow or direct heat absorbtion. l the insulation is useless, since you are trying to melt the ice to begin with. But, the whole think is pointless. There’s not enough “cold” in that amount of ice to cool anything larger than a closet, if that. It’s like peeing in your swimming pool to warm it up for your neighborhood pool party. You have too little “warm” in your 8 ounces of pee to warm a 10,000 gallon pool. Likewise, there’s too little “cool” in a gallon of water ice to cool a normal size room. You might feel a little better if it blew directly on you, but if that’s what you are going to do, just skip all the fluff and sit in front of the fan without all the fancy stuff. My friend and I tried this today with a standard 6″ fan from Wal-Mart, and it totally failed. We used smaller pipe and tried to toy with the configuration of the holes, but it was no good. Got no output from the holes at all. Maybe upload some pictures and the readers here could suggest something to get it working? made one of these. Air flow was good. did not get very cold air out of it. might be better if it was just ice in the bucket but the gallon jug is not providing much cooling. Maybe try taking the cap off the jug? Anyone have success with this? What about this idea. With the holes being positioned as high on the bucket as they are, this will cause the cool air of the ice to mainly stay within the cooler. Hot air rises and the fan is on top. The cool is air trapped in the lower half of the bucket as the room temp air being blown (by the fan) into the bucket is the first to exit the bucket with only minimal cool air existing as well. I don’t think the cooler air will have a chance to settle to the bottom when the fan is turned on. I think you’re over thinking the use for this. It is not intended to cool the entire room by 40 degrees. It’s simply a way to introduce cooler air to a warmer environment. I believe this would be a great idea for a small tent in summer. At night, get this going, and you could bring the temp down a bit lower while you sleep. Trust me, ANYTHING that helps while camping in MO is a welcome idea. 2.) This device does absolutely nothing to cool the air. In fact, the device actually adds a slight amount of heat to the air via the fan motor. All this device is doing is transferring the cool air from the ice through the holes in the bucket. 3.) During a power outage, you typically don’t have a renewable method of creating ice… so this bucket device is extremely temporary without a massive available supply of ice. To cool air and remove humidity from the air, you need evaporation to take place. There’s really nothing you can do to cool a room in your house for an extended period of time without a compressor, evaporator, condenser coils, and electricity to power a blower. During a power outage, your compressor, evaporator air conditioner won’t work either. 1. It DOES remove humidity from the room, when the warm humid air from the room is sucked into the container, and thencirculated over the surface of the ice container, the moisture that was in the air condenses out of the air and forms as droplets of water on the outside of the container, it will then run down the container and form a pool of condensate water. The air exiting the container is cooler, and drier, hence ‘air conditioning’. 2. Wrong. It DOES cool the air. It may not be as efficient as blowing air over a copper coil with aliminum finned device that is at a very cold temperature, but it will transfer the heat in the air TO to container with ice, as it raises the temperature of the ice, it melts, the air that has circulated over it is there fore ‘less hot’ than before it came in contact with the ice container. 3. During a power outtage, if you are lucky enough (smart enough?) to have a deep freezer (or two) with containers of ice, you will have ice available, for a while. ‘Extended periods of time’ is a relative term, as long as you can come up with ice, you will have cooling. Small fans can be battery or solar powered. Do I have to cut a hole in the styrofoam lid also. No you don’t have to use the styrofoam lid at all. We used two buckets, one inside the other, and glued them. We then drilled a hole through the bottom outer bucket and sprayed “Great stuff” insulation inside. We also used a large computer fan instead of the one in the vid. We also used a longer piece of pvc pipe with a “T” for the duct. The duct is attached to the top/lid, essentially creating distance between the input and output. As for the ice, we weren’t able to fit two 1 gallon jugs, but we were able to fit three frozen .5 gal jugs. We’re happy with the resulting relative comfort. We get a subjective but consistent 15 cooling effect over approx 3-4 hrs. in very humid S FL. Hi Manny, glad to hear this worked for you. Any chance you could take some pictures to share what it looks like? I may be able to submit a drawing later. I apologize, I guess I should have used past tense. I no longer have the unit. But imagine the lid with two openings at opposite ends of it. The larger opening was for the fan, and an opening for the 2″x24″ duct. The duct was ~4″ into the lid and sealed with silicone caulking. I should point out though, I really think creating distance between the air input and output makes a difference. Because of the duct being upright and venting through a “T” I think the duct has a certain radiation effect to it. In fact my next build will have an even longer duct and possibly a reducer at the end. Maybe even a rain guard to redirect the output downward and to have another, metallic surface to radiate. I may even use aluminum conduit for the duct? Lastly, I would suggest not using it in a carpeted room. You’ll be robbed of any cooling effect. We used this cooler in the kitchen, bathroom and the kids room. The kids room is carpeted, and there was not much relief, but there was “some” nominal cooling. It actually worked best by running the ceiling fan in winter mode. The person whom I gave the cooler to used it in a security guard’s booth at night. She was able to comfortably survive the night shift during the summer months. She also had a way to keep frozen jugs, so resupplying wasn’t an issue. I’ve lost touch with her since. It’s been a few years now. Maybe I’ll call her and find out if she still has it. Thanks very much for the write-up. If you do end up making another unit I think a lot of people here would love to see pictures or drawings of your unit. Will do! Thanks for the opportunity to share about my build, and for your great site. I’m not normally much of a poster, but I do visit often. she wants to see pics of your unit!!!!!!! Found one here! Look at Q and A – people use them for this exact purpose. 10$ and free shipping if you get a few. On line order liners from Home depot for a package of 3 quantity at about 19 bucks including tax. Home Depot has them online in a 3-pack. Sherwin Williams Paint store carries the liners as well. Would the use of dry ice instead of regular ice make a significant difference in cooling power? Does anyone think it would be possible to use this system in my car to keep it cool enough for my dog for about 4 hours? I’d be checking on him periodically. I don’t know if it would work better or worse in a small space like a wagon or SUV. I’d have ample auxiliary power to run the fan but not the car’s AC. Of course I’d be testing on myself first but wondered if there were any opinions before I make the contraption. If ya did that the solar panel theoretically would be perfect. And rather than a pipe coupling sticking out, perhaps just make a hole near the bottom of the jug so the dog could lap up the condensation as it collects at the bottom. Not saying it’s a good idea, but it sounds good on paper..
No. There is no way that a car, which can heat to over 100 degrees when only in the 70’s outside, could be cooled by this contraption. Seriously. Don’t do this. Absolutely positively NO! under NO circumstances can you ever leave an animal or any other living thing in a vehicle during the day for any period of time. IF you have windows open… there is NOT direct sun light BEATING DOWN on your car and it is not over 80 some odd degrees out. This would work for a limited amount of time keeping the car cooler than it would normally be. And with shade it could even keep the car cooler than the ambient outside temp for a few hours. But don’t risk your dogs life on a stupid internet notion. Has anyone tried using an igloo insulated oval tall cooler instead of two buckets? Its already insulated. We are about to try right now. Cannot wait to hear about that! Great idea! I myself will be my own skeptic. To the nay sayers, this is a cheap “swamp cooler”. Not an air conditioner. It’s like you are arguing the fact that a mag light is brighter tan a match. Thank you all you Captain Obviouses. Save the soap boxing, PLEASE! I live in Seattle Wa where humidity is just something you live with. Grew up in Orlando Fl, pretty humid there too. If I can get a cool enough breeze long enough to fall asleep by for a few bucks, sign me up!! Its warm only for a few months up here, so window unit a/cs take up closet/garage space the other 9 months. I tried ACE, Home Depot, Lowes, and McLendon up here, no one had bucket liners. I took poster board, wrapped it around a milk just and taped the outer seam, Then, centered it in the middle of a 5 gal bucket. I’ll know tomorrow after the Great Stuff expanding foam dries that I sprayed in the space between if it works. If not, I’m out $15 on the same parts as used above otherwise. I’m pretty sure I’ve wasted much more than that for worse things in my life time! Ha! Wish me luck. Please post results once you’ve built it! Tried this. Built it exactly as the video specified. The temperature in the room actually got warmer. I even turned the fan way down, but still the warmth remained. I sat an electronic thermometer by the bucket and checked it every 15 minutes and took note of the temperature. It gradually increased over a 4 hour period from 81 degrees to 85.1 degrees. For the last hour, with a fresh frozen gallon, I even placed the thermometer right in front of the ports. Still read 85.1 degrees for a solid hour. Given this data, I would have to say this does not work. Also note that my humidity level (my electronic thermometer measures this as well) went from 45% to 52% so not a huge difference there. Based on this information, I would have to say this idea is busted. PS – After removing the bucket and turning off the fan, the temperature went from 85.1 to 82 degrees in 45 minutes. Here’s what I think. This is an internet hoax. Probably done by some smartass engineering students to make fun of English majors. Although there have been many posts here, most of them are about finding the damn bucket liners. The few who have made this have found, as I have, this doesn’t work at all! Not even a little, and I followed the directions verbatim. Folks, don’t be sucked into this prank like the rest of us have! Are you saying that having a small 12v fan on in the room increased the temperature by 3 degrees? Did you plug the fan into a 120v outlet? I just got everything to try this to get us through today and tomorrow since the temperatures are supposed to drop again soon. I put a lot of work into this (since I do not have hole saws) and it doesn’t produce much unless you are sitting right next to it. I’m disappointed. But I have only had it running for 20 minutes. If it is supposed to take time just let me know. As others have suggested here, the air may not be moving enough around the frozen gallon jug. I would think this should be fixed by instead boring holes near the bottom rather than top. What about putting the vents at the bottom of the bucket rather than the top? You know, because cold air sinks? Still keep the fan up top? Has anyone tried this? Latest post to the amazon product link shows out of stock. I’ve looked EVERYWHERE, and can’t find these liners. Found bucket with liner at farmandfleet.com. Its called a Sit-N-Fish. I have tried home depot, lowes, amazon, online, etc., I cannot find the styrofoam liners either. Can anyone suggest where to find these in the Los Angeles, CA area? They weren’t available until very recently but can now be ordered from Home Depot online. They will then ship for free to your nearest store. That said, I’ve put mine together and frankly, it doesn’t work. Very disappointed. Tried with holes bored at bottom. Does not work. HomeDepot.com has bucket liners them. A set of 3. I just ordered some from homedepot.com for $5.97 each. I put the ports down at the bottom where the cold air naturally flows. I insulated with reflectix, which is available at Lowe’s or Home Depot. It’s a bit more expensive, but vs the electricity cost of an AC, it’s a one time expense. **Most Importantly** I used 4 one liter plastic bottles. They have 3 times the surface area of a 1 gal jug. and the air can actually circulate around and in between them. Surface Area- a place for all the moisture to condensate and evaporate FTW! This does not work. Do not waste your time and $$$ on trying to find parts. Huge disappointment. Used spray insulation for liner. Air flow not very good. Does their need to be space around gallon jug?? I built one for a project. In a 72 degree room the bucket A/C only put out 64 degree air for me. I see a flaw in this design. I propose the fan be internal and only blowing air from the inside of the bucket. Drawing air from the outside in, will only heat things up. The way this works is by drawing the heated air in the room across the ice which would cool the air slightly given the area and temperature of the gallon jug combined with the amount of time the air is exposed to the cooling effects of the jug. Therefore the air must come from outside of the bucket.. Furthermore, there would be virtually no moisture removal from the air which is more related to comfort level than temperature, unless you were to operate simultaneously a number of these that could equal the cooling capacity of an average sized room air conditioner. Would there be any kind of noticeable difference if you were to put holes towards the bottom and flipped the fan around on top so rather than forcing air down the bucket but pulling the air up and out? If that makes any sense. Seriously people. Use 2 buckets first bucket being the 5 gallon with the liner and the 3 half gallon jugs and a quarter size hole in the top and the small pvc pipe from quarter size hole to a 2.5 gallon minnow bucket put a couple 20 oz bottles in the minnow bucket and vent out from the minnow bucket. Now the air will be cool because of time spent in the bucket before being released. Source… common sense. Im a plumber in arizona and am wondering if this is something worth spending a few bucks to make with a battery powered fan to help with the intense heat while I’m working undergrounds, are the things worth it at all..? I tried this for our birds that we keep outside and it did nothing. I followed your YouTube video to the tee. I feel it was a waste of time and money. Maybe it works in your air condition house but not in the 109 degree heat with 3 % humidity. I really feel that this was a hoax. Save the hassle of building this assembly. You will get the same effect by setting the frozen gallon jug of water in front of the fan. Aim everything so it blows on you. Thermal transfer is thermal transfer, no matter what fancy assembly you design or assemble. Not a bad idea – we used to do this for a very hot back office at the restaurant I worked at. Loose ice in a large metal bowl with a fan blowing overtop – worked better than anything else we ever tried. I use a 5 gal bucket filled with ice water and a coil of copper tubing in order to cool/condense air compressor air prior to being run into a sand blasting unit. At the end of the coil is a moisture trap, then the air runs through about 20 ft of hose, and still comes out quite cold. Now this is at about 90 cfm, coming through about a 1/4″ tube.. and it’s still cold. I feel like this could be tinkered with, larger diameter tubing and a different form of pushing air through (would be hard with a conventional fan) and maybe something way more efficient at thermal convection could be created. Just blowing air on ice surely isn’t very effective at cooling the air down..
Also, this would allow for the use of dry ice as the CO2 is separated from the cooling air. Throw a tube and lid on top and have the tube run out of the room to the CO2 can vent out? I live in az where it’s HOT in the summer. Have a workbench in the garage and thinking of setting this up to cool down for the 1 to 2 hours I spend milling around at the bench. Very interested to see how this turns out. mine doesnt work. i used styrofoam sheet and cut to size. and a bucket lid for the fan. whats wrong here? well, after reading all the comments and suggestions, i guess the real solution is to get in touch with the guys from “Myth Busters” and have them take a look at different types of possible solutions, after all they have alot more money to burn for research than we do. There is certainly nothing wrong with this project, but there are easier and cheaper ways to do the same thing. A simple styrofoam ice chest, with either ice packs or some 2 litre pop bottles filled with frozen water would do the job just as well, cut a whole in the top and have a fan facing downward and cut some vent ports for the air to exhaust. Warm air from the room is sucked into the ice chest, it gives it’s heat up to the frozen water bottles and exits at a reduced temperature. In a small room, with the door shut, you’ll have cooling as long as you have 35 to 45 degree temps on the surface of those pop bottles for the air to blow over and make contact with, just like air blowing over the fins of the evaporator coil of an a/c unit, which is of course cooled by a continous circulation of refrigerant, and of course the aluminum fins are better at heat transfer than plastic, but it’s the same principle. My central unit is temporarily out, and although I have an ancient window unit in my bedroom, it is less than wonderful, I have been setting 2 litre bottles of ice in front of an 8″ fan pointed right at my bed, sitting in a pie pan, and it actually gets quite chilly. Since the fridge that makes the ice is at the opposite end of the house, it is not adding heat to the room. The ice in the bottles ABSORB the heat as the air in the room blows over it, and it changes state from ice to water (phase change), whether the iced bottles are in a bucket, a stryofoam cooler, or sitting on a pie pan, heat transfer will take place when a fan blows the room air over the bottle, a bit of experimenting is in order for the best efficiency, of course, but this is elementary physics. Also, it is not an evaporative cooler or swamp cooler, as we are not evaporating water to cool the air, the condensation on the side of the bottles and in my pie pan is the humidity pulled out of the air, the air is cooled, and dehumidified, making it much more comfortable. You need ice water flowing through a heat exchanger (like radiator with fins) to make the heat transfer from air in car/room into the ice cold water. Of course also using a fan blowing through heat exchanger. First: Maximize the cooling surfaces that the air will encounter as it passes thru the bucket. The more cold surfaces that the air passes, the colder it will get. One gallon jug provides limited surface area. 3 smaller containers will provide more surface area. More smaller containers will cool the air even better. My thoughts are that you should fill the bucket with a bunch of small frozen water bottles (the smaller the better). This will provide much more cold surface areas for the air to encounter and transfer its heat. Also, as a side benefit, the water bottles may be easier to fit in the freezer. Exhaust location. The longer the air stays in the bucket, the cooler it will get. The design shown above doesn’t really create a very good flow path in my opinion. Placing the exhaust vents at the bottom would force the air to pass thru all of the frozen water bottles. 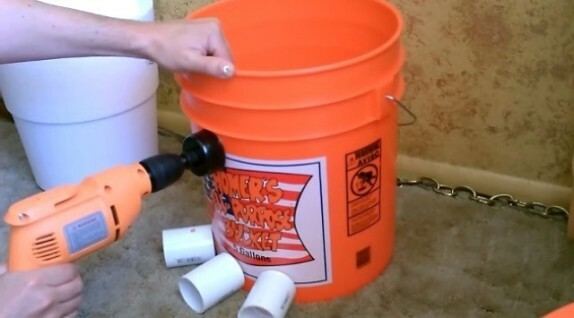 Better yet, as mentioned in one of the earlier posts, place PVC pipes vertically thru the lid and have them go all the way to the bottom of the bucket, maybe an inch from the bottom. This would force the air to flow to the bottom of the bucket, enter the tube, and then make a second pass upwards thru the cold zone (within the pipe). If you really want to get creative, you could devise some longer, maze-like exhaust pipes within the bucket to maximize time in the cold zone. Also, I would make the vertical exhaust pipe really tall so that the cold air vents out higher in the room. Remember that cold air sinks to the floor – the higher that the cold air gets in the room, the cooler the room will likely feel. Also – if you have a ceiling fan or another fan to stir the cold air in the room around, it will help, else the cold air tends to all just settle low near the floor. Also of note, this device is NOT going to have capacity to cool a large room. You are going to want to use it in a small room with the door SHUT (else the cold air just spills away out the door). As far as insulation of the bucket goes – I think that too much attention is being placed on that aspect – you can just wrap some towels around the outside of the bucket and that would probably do fine. Overall though, I think that this is a great idea and very intriguing. Keep in mind though that the better that you make the design and the colder that the air gets exiting the bucket, the quicker the ice will melt and need to be replaced. Ed, you seem to be one of the few people here that ‘get it’. The whole insulation thing is, IMHO, completely unnecessary. We are, after all, not interest in storing ice as long as possible in a container, but get the heat that is in the room transferred to the containers with ice and back out into the room. In an uninsulated bucket, the bucket may be cool to the touch, worse case scenario, it *might* have a little condensate on it, but if the air flow is adequate, I doubt it. And yes, multiple small containers of ice offering more net surface area will result in better heat transfer, just as copper tubing with fins attached conduct heat much better than plain tubing. If you use the vertical exhaust vents, using metallic piping will greatly increase the cooling. PVC acts as an insulator and will not get very cold, but metallic pipes will cool nicely in the bucket and will cool the air quite a bit more as it travels upwards and outwards thru the long pipes. Also, more pipes coming up vertically will equate to quicker cooling. I would recommend 3 or 4 vertical vent pipes. Also – if one bucket isn’t cooling the room enough, go with 2 buckets perhaps. Haven’t you ever heard of a Swamp Cooler? This is just a small swamp cooler, great idea for a cheap, quick fix to a hot, dry environment! Quit with the dramatics, if you don’t want to do it don’t comment with your over thought explanations of why this will or will not work. I think it is a great idea especially for doing outdoor craft shows, keeps the temp under your canopy about 10 to 20 degrees cooler than the other vendor’s areas! It’s not a swamp cooler. A swamp cooler uses water that is near the same temperature as the environment and evaporates the dripping water in a stream of air cooling the air somewhat, and only works in a dry environment, as water does not evaporate well in high humidity. But, given that you are doing it in a low humidity environment, swamp coolers will cool the air as the water evaporates, much as the water evaporates off your skin when you sweat or just get out of a swimming pool. This is different, you are passing air over a very chilled surface, e.g., an ice container, much like passing air over a coil with cold refrigerant in it. Same exact principle, except here you must replace the ice containers, in an air conditioning system with refrigerant, it carries the heat away and gets replenished continually. I built one. First used 3 holes like you have. Seemed to bog fan down and no throughput. Doubled the holes with 3 more directly below at bottom and did not make a difference. Thoughts? Bigger fan. I did mount the fan to the cover and caulk it. Maybe sealed to tight? If you notice when he shoots the thermometer he is pointed it directly into the pvc which is actually reading the temperature on the ice jug directly (surface temp.) not air temp. Exactly! The ice is 40 some degrees, not the air outside the bucket. I don’t know what everyone is doing wrong! I keep my garage nice and cool in the Texas Summer. All I did was build 35 buckets and then lined them in front of my closed garage door. It works great!!!! I cannot get those liners in the time frame I need. Could I use anything else? It will probably work without the liner, try drilling the holes closer to the bottom rather than the top. I was wondering why 2 buckets and decided that with one you would get condensation on the outside and thus a wet floor. I use mine with a block of ice still in the plastic wrap. No water escapes. You do need to cut a hole in the styrafoam top of course .That seems to be neglected in the instructions. This only works in a SMALL area like the inside of a boat at the dock which is where I use it. Does make a difference if you are inside and the boat is “buttoned up”. Oh…and no it is NOT an air conditioner it’s a swamp cooler. Stop over thinking it for heavens sake! Built one. It cools the air, at best, about 2 degrees, and only a very short distance away. Literally, of almost no value. He’s probably measuring the temp of the container of ice inside the bucket, or the air inside the bucket. To the average person, ignorant of all the factors related to air cooling, this seems like it should work, but it doesn’t. Well, its 71 degrees in this room, and 69 degrees on the floor, near the bucket. If you feel that’s worth driving to Home Depot, and spending $ on the bucket, fan, pvc, and drill bits, that’s your call. Out of curiosity, I put a wet wash cloth on top of the ice containers in the bucket, and I did get another couple degrees of cooling. Perhaps combing the ice with some sort of evaporative cooling feature could provide a good result. The wash rag will dry quite quickly though. I was so excited about these units when I read that it will “create 5 hours of surprisingly cool air.” I built two of these buckets and followed the instructions precisely – bought the Styrofoam buckets on-line, ordered the exact same fans recommended, etc. It was a complete waste of time and money! I even put a more powerful fan on the bucket – gave me more air flow, but not cool air. I am very disappointed in the outcome. Unless someone else has an idea will probably throw these two buckets away. what is the liner..What it looks like..What is this material..?? Have you tried it? where can i get an already built of this piece? How about if you use the aluminum beers bottles filled with water and frozen inside a Styrofoam cooler. Place the fan on the side of the cooler and have the airvents on the other side of the cooler but lower than the input fan, this should force the air to go thru the frozen aluminum bottles and it should cool the air better since it will be passing thru all the bottles in the cooler. Well I modified it a bit and works pretty well. I’ll be posting it in a bit but my modified bucket goes like this. I used 2 buckets one 5gal inside another 5gal with some towels wrapped around one and stuck it inside the other. Got a 2d cell tent fan from eBay for the fan on top.follow said instructions for pipes but placement of 2 in stead of 3. Holes where made 3 and 5 inches from bottom. I used 1gallon of frozen water in container and 8 frozen water bottles and surrounded the gallon with the bottles.then a piece of cardboard cut to devert a kinda cyclone air flow to move the air around the ice containers then out the 2 holes. Fan batteries last close to 24 hours on low ice lasted 15 hours in a tent in shade kept it cool.the tent was a 2 man tent.I’m in the Chicago land area.good stuff. I bought one off ebay that someone is making. I think it’s well worth the money, and it seems like they put the best possible fan on it. The humidity here is always high, and it keeps our screened in porch comfortable. How ’bout this? Couldn’t afford to have my car a/c fixed so I picked up a small fan that plugs into the cig lighter. I use a 1 gallon jug surrounded by smaller water bottles. When they melt, i get something cool to drink. Also use flex drain hose coming out of the bucket to direct the air exactly where I want it. Interior of car is small enough that this cools really well! I keep the styro lid in the car to seal it if I need to park the car for awhile. Sun shade and tinted windows help so I’m not starting with oven temp air.. I just made the same thing for my work truck. I live in texas and its about to be 103 for days. I would post a pic but they are all on my phone. Why do you even need the PVC? Won’t the chilled air blow out the holes you drill in the bucket regardless? This is no better than blowing air over a block of ice except for humidity, which is important in a humid environment. Learn the fundamental principles, and this stuff will no longer fool you. 1) ice absorbs heat as it melts (shouldn’t shock anyone). 2) evaporating water (or other liquids) absorbs heat… Again, not surprising if you think about how swamp coolers work. 3) making ice From water removes heat from the water (and releases that heat to the atmosphere where the ice (once water) isn’t. 4)the laws of thermodynamics state that as you make the ice, you lose energy through what they refer to as ‘entropy’ (you might just call it the efficiency factor, which is always less than 100%, and generally MUCH less… maybe 30 – 40%). This is the bad part of this idea… Every energy exchange that takes place loses something to entropy… The refrigerator that makes the ice, the water that becomes solid, the fan that blows air, the solid as it melts. You lose every time… Not too efficient, but it does cool the air. 1,470 btuh after it is melted. Here is the kicker. The room needs 1,200 btu per hour. The 8 lb of ice takes 3 hours to melt, say. The room needed 36,000 btu in 3 hour, the bucket only produced 1,470. That is why it will not work. It will work for a dog house, not a room in summer. Ok question here. 1. Would metal pipe be better than pvc for the exhaust to be a few inches from the bottom and exiting out the top. 2, would frozen aluminum or glass be better than plastic? 3, I’m thinking it would be better to contain the air in longer with a smaller pipe to increase the time to cool any thoughts? A typical hot room has objects in it that store heat, mainly the exterior walls, floors, furniture and people. AC is measured in tons, one ton is comparable to one ton of ice per day or 12,000 btuh. A 100 sf room, depending on where it is, design temp, degree days, etc, might need 2/5 tons per hour to cool it or 10,000 btuh. 8,000 less than needed if the ice is assumed to melt in one hour, which it won’t, so if it melts in 3 hours, then the bucket is that much worse. It would produce only 1,472 btuh where it needs 12,000×3 or 36,000 btu. It’s physics, you get cold air, but it ain’t enough. Doesn’t seemed to be doing a good job in cooling down a room effectively. Has anyone try this and manage to cool down a room considerably? Has anybody tried this?. Where can i get a read to use of this piece? I bet Home Depot came up with this crap to sell $18.00 3 packs of Styrofoam liners(they get for 79 cents) and $5.00 buckets.You can buy a funcioning window ac unit now for $89.00 people. Beyer yet,fill your 5 gal bucket wth ice and sit on it.It’ll cool something!